The journey to creating this cocktail has been a long one, that began as a conversation, more than a year ago, over tea and cake, at a Secret Tea Society meeting. Brought together by a love of tea, gin and conversation, Sarah (Sass) Allard shared with me, her vision for an exclusive, yet relaxed Tea Lounge where like minded people could come together and enjoy some exceptional teas. We discussed the possibility of my creating a cocktail for her that would encapsulate her vision and would, one day, grace the incredibly chic tables of her Tea Lounge. It was important to create a cocktail that would be enjoyed by all at the Tea Lounge, but equally, it had to represent Sarah herself as the lounge will be an embodiment of her personal vision. With that in mind, it was imperative that the cocktail should contain tea in some shape or form and knowing that Sarah is more than partial to the rich, malty flavour of Assam, the first ingredient was assured. Deciding on spirits was slightly more complex - regular followers will know that I am a bit of a gin geek and was therefore bursting with ideas for gin/tea based cocktails. However, much as Sarah enjoys gin, her real passion is for rum; with her Trinidadian heritage, the spirit of the Caribbean runs through her veins and so the spirit of the Caribbean was to run through this cocktail. 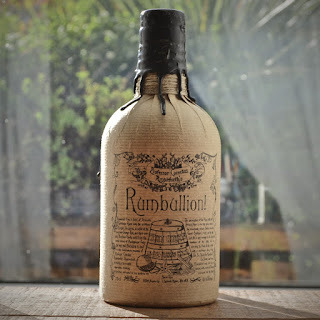 Rum and tea have long been traditional bedfellows although it's often served as a hot drink, and creating a martini style drink that would be enjoyed by all, proved trickier than I had first envisaged. Part of the problem was the tea itself; results in the strength of the brewed tea varied slightly, which significantly changed the taste of the cocktail. Add to that, the fact that the tea continued to infuse, even after the leaves were removed, causing the flavour to become bitter and woody, it soon became apparent that another solution was necessary. 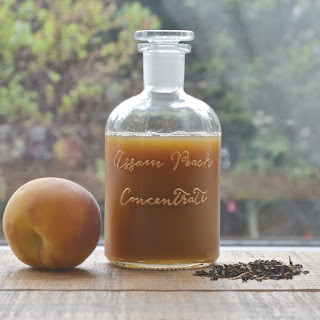 The cocktail also had to be something that could be prepared in a reasonable amount of time, if it was to appear on the menu of the Tea Lounge and so, the idea of an Assam Peach Concentrate was conceived. This could be prepared in advance, in large quantities, if necessary and stored safely in the fridge. After the initial effort of making the concentrate, the building of the cocktail would be relatively simple. 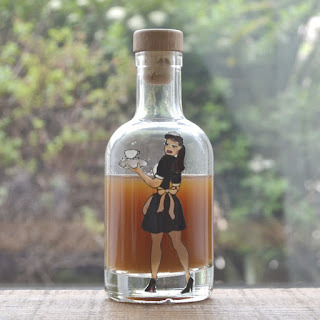 So, before I impart the recipe for the Tease Maid cocktail, I must just share with you a few details about Sarah (Sass) Allard and her upcoming Tea Lounge. The fabulously apt name, 'Tease Maid' was conceived by her and sums up perfectly, the spirit of the drink. 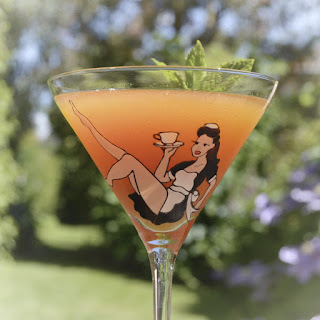 The 'Tease Maid' character that graces the bottle and martini glass featured in this post, was created by me and I used Sarah herself, as my inspiration. The Tea Lounge is (at the time of publication of this post) still in the conceptual stage, but you can follow Sarah, and I urge you to do so, on twitter (@teapreneur_girl) and Facebook (teapreneur) to keep up to date with all her news. Add everything, bar the mint, to cocktail shaker, with a handful of ice. With the lid firmly closed, shake until the outside of the shaker develops a frosty bloom (about 20secs). Slap the mint gently between the palms of your hands to release the minty aroma and garnish the drink.